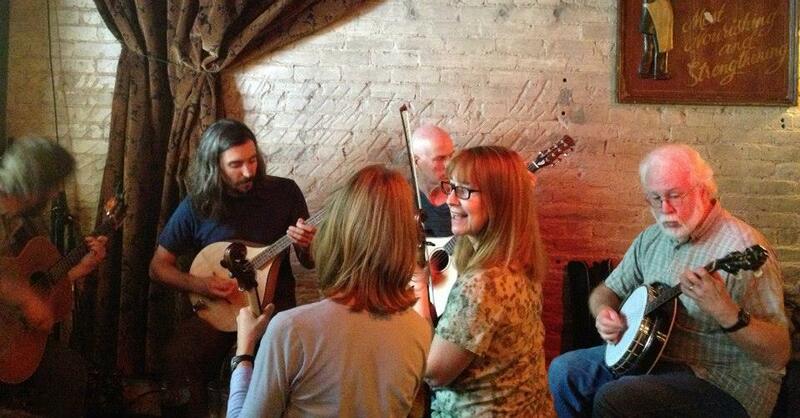 Asheville Mandolin – Page 2 – Celebrating the Mandolin in Asheville NC, Celtic Style! This past Saturday, I performed a few jigs and reels with the band Noonday Feast, here in Asheville. The above video is of the tune Attfield’s Lament, which I posted a few months ago. This tune picked up another name recently. Farewell to Prince Rhaegar. Below you will find a great couple of non traditional but well written tunes called, Waves and Tides and Crow Hill. Plenty of mandolin/bazouki content here. These are original compositions by Noonday Feast. Many Moon’s ago, I commented on my enjoyment of the tune Muireann’s Jig. I found some time to tab it out, and here it is. Find me at Celtic Week and lets have a go at it? Here is a video to play along with in the mean time. More than two months later, I still haven’t posted those recordings I thought I’d get around too. Work has been particularly busy. However, I needed a break and I needed to play some more mandolin. I got the idea to record some tunes from the Asheville Celtic Mandolin Collection song book. Here you will find, The Maple Leaf and Banish Misfortune. I realize I’ve recorded Banish Misfortune before on this YouTube channel, but it was worth redoing. As always, both of these tunes were recorded with a metronome. Haven’t yet had a chance to post the previous sets mentioned. Yet, yesterday morning a particular mood came over me and I made a recording of Jacquelyn’s First, a single reel, and Roscommon Reel. I also found the time to tab out Dunford’s Fancy, a tune by the Waterboys. Here is the mandolin (tab) tablature and sheet music for the above mentioned tunes. Here is the recording of Jacquelyn’s First and the Roscommon Reel. PS- You’ll notice on the tab for Jacquelyn’s First, it says “capo 1st fret”. I started playing it a half a step higher at first on the octave mandolin. This weekend, I was left alone. With nothing to do and no one around, I decided to spend the weekend with my octave mandolin. Originally I set out to make a little recording of O’Keefe’s Slide with some non-standard back up chords. However, the recording just kept going…and going…and going. Here’s something I call O’Keefe’s Strawberry Slide. I found some old recordings of a practice D. Murray and W. Byers and myself preparing for the AB-Tech Benefit Gig the first year we were asked to play. I’ll be posting two sets. Out of the Ocean/Morrison’s/Mug of Brown Ale and Garret Barry’s/Hag at the Churn/Rose in the Heather. Celtic Week is here! In honor of this noble week I’ve been playing around with some recordings and tab to post. So far, I’ve got a counter melody for Return from Fingal. This counter melody was composed by Jim Magill. His wife, Beth, and I played a little gig in Hendersonville a month or so back, and she played this lovely counter melody on her flute while I played the tune on mandolin. Before she packed up to attend the Swannanoa Gathering, I was able to get a copy of the music to tab out. Ideally, I aim to create a recording of both these parts for the youtube channel http://www.youtube.com/ashevillemandolin. I have also been working on a recording of Na Ceannabhain Bhana/The Black Rogue/The Noon Day Feast . So far I’ve got an octave mandolin track and a mandolin track. Once, I get it tightened up and a backing track I’ll post it. All three of these tune can be found in the Asheville Celtic Mandolin Collection.